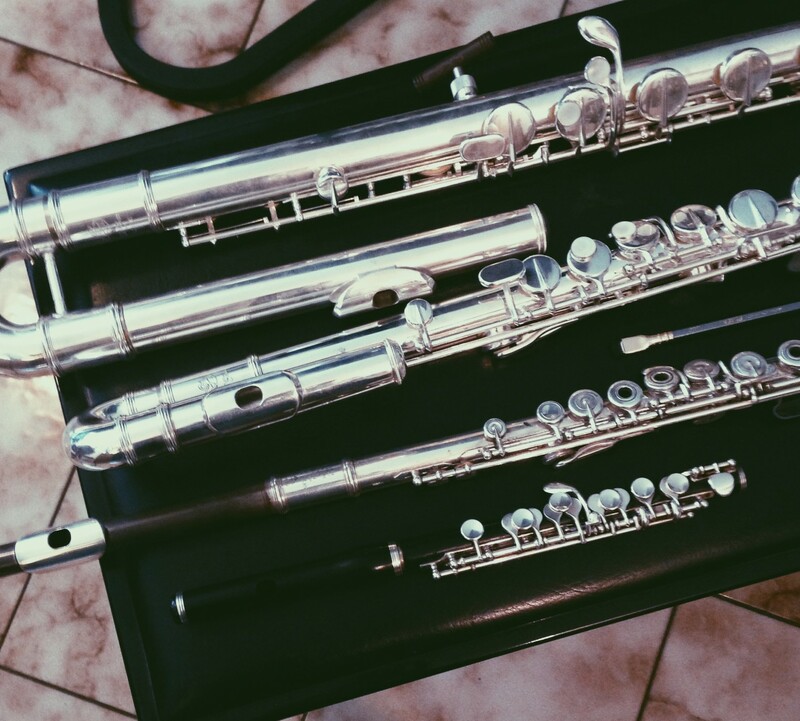 When I wrote my previous post on beginning the process of learning Chris Dench’s alto flute solo Gelb : Violett I had been struck by a few key things that I felt I needed to say. Now, a few days later – and the first time I’ve really had the chance to work much at this piece since that initial session – I’m not quite so certain I have worthwhile things to get down. I wanted to write anyway; as I mentioned earlier, it’s a kind of self-motivation, a way of keeping myself accountable. I’m also quite interested to document the process far more thoroughly than my usual note or two in my daily journal (“tone was rubbish today, had a tight spot under my sternum and got frustrated. learnt the first four lines of Bartók excerpt to 120BPM”). It’s all about learning how I do things and how I might do things better. So, as you can see from the above image, I’ve started marking up my score with plenty of colour as well as pencilling in the tempos of various tuplets, and where the beats lie. Tempo and metre changes are also highlighted, and I’ve marked the two alternating characters (“confident, brightly” and “suddenly hushed and hesitant”) quite literally with the colours of the title. Dench quotes artist and writer Johannes Itten in his preliminary notes for the piece: “Yellow : violet = bright knowledge : dark, emotional piety”. One of the wonderful things that I’ve found about Dench’s flute music is that he really knows the instrument very well, and you can see that in the above example as he has not only accounted for the dynamic change that occurs in these colour changes, but in fact he is (I believe) utilising it to create a strange, slightly stilted and warbling vibrato. Quarter note = 134, therefore eighth note = 268 (2 x 134), and sixteenth note = 536 (4 x 134). For the 8:9 eighth notes, I divide 268 by 9 (29.777…) then multiply that result by 8 (238.222…). Rounding down the decimal points and we get a new tempo of quarter note ≈ 119, seeings as the notes contained in this bracket are notated as quarter notes. For the 15:17 sixteenth notes, 536 is divided by 17 (≈ 31.5) and multiplied by 15 (≈ 473). To get a more useable tempo, I then divide this number by 5 to get five sixteenth notes ≈ 95. These tempi are just for the learning stage. They’re to give me a good idea of how fast the notes go by and force me to think about subdivisions and groupings. I’ve got Liam on the job of creating a click track for me, and so will practice with that as I advance. Finally I will ditch all of these props and think a lot less about exact rhythms, instead letting the music flow and trusting my body to remember these moment-to-moment expansions and contractions. Apart from marking up and doing my head in with (admittedly fairly simple) mathematics, I did do some actual flute practice today. Mostly I continued with my imaging method, working in small chunks and building up towards a sub-phrase, a phrase, or even a line or two. Most of the first page I can now play through, more or less, if I pretend the last measure of line two doesn’t exist (lol!). There’s plenty of tidying up to do, and familiarity and flow to gain. But already my confidence is bolstered and I’m looking forward to diving right back in again tomorrow.